Welcome to the home of the Cincinnati HitTrax League: The premier HitTrax League & Tournament host in Cincinnati. Whether your individual athlete, team, or organization are looking for the competitive edge in training or just want to have fun, we have a league or membership option that fits everyone! Contact us or come see today how our MLB, college, high school and youth players are utilizing our HitTrax Hitting Simulator and advancing their game! HitTrax is the first and only baseball hitting & pitching simulator. (Real baseballs. Real swings. Live pitching. Think of a golf simulator, but with almost unlimited capabilities!) It utilizes a powerful combination of analytics and entertainment that finally brings the feel and experience of live-baseball to the indoors. HitTrax delivers powerful innovation to indoor training by measuring real-time data and displaying live results for immediate feedback, and better results! Do you know your exact batting average throughout all 9 quadrants of the strike zone? 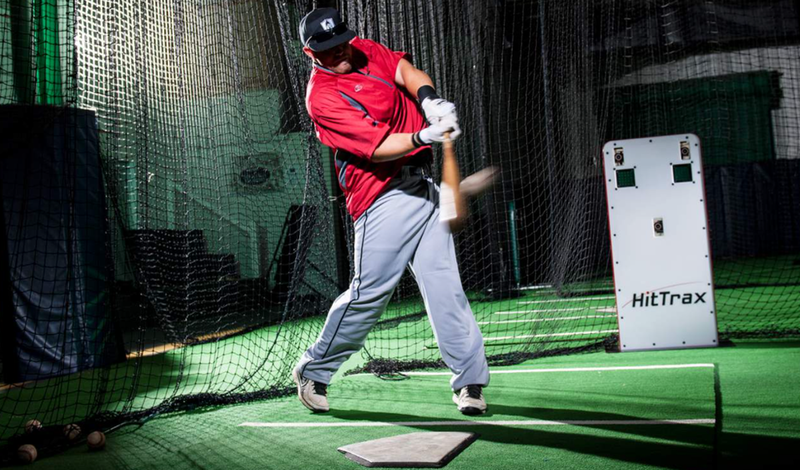 Do you know what pitches you tend to lift, ground out, or swing and miss? How do you stack up against the top hitters your age across the city, state, region, or country? Can you make it to the top of the national leader-board? These questions are all answered through the HitTrax platform and technology. Come check out why our professional players are loving the real-time statistics and visual feedback while preparing for their upcoming season like never before! The greatest capabilities from HitTrax Technology come from advanced analytics and the instant feedback it provides throughout the training session. If your player, team, or entire organization needs to improve any aspect of their hitting, utilizing the power of HitTrax is almost the only choice to take your training to the highest level. HitTrax isn't just for serious players and advanced training. It's also one of the most fun, addicting games you'll ever play! Take your pick of almost any field on earth, from Williamsport to every Major League Ballpark, and feel the excitement of hitting a home run at Fenway, Wrigley, or the Little League World Series. There are multiple simulated game, competition, and tournament modes that include: Batting Practice, Home Run Derby, Hard-Hit Mode, and Speed rounds. Play against your buddies or players all across the world. It's all up to you!